Q-Connect Manilla Foolscap Storage Bag (Pack of 50) KF25001 Pack of 50 Q-Connect Storage Bag manufactured from strong manilla with reinforced spine. White tape for secure fastening and a large label area for ease of identification. Supplied flat packed. Foolscap. Internal dimensions - W100xD255xH350mm. 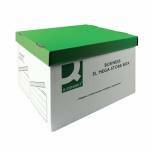 Q-Connect Green and White Mega-Store Box (Pack of 10) KF21738 Pack of 10 El Mega - Store Box. perfect for storage and for transporting large quantities of records and filing, including computer printout. Holds 4 Q-Connect business transfer cases or 5 Q-Connect business magazine files. Internal dimensions W383x D430x H295. 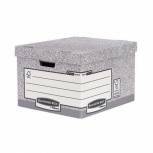 Bankers Box Large Grey Storage Box (Pack of 10) 01810-FFLP Pack of 10 Archive System Storage Box. Sturdy corrugated box with handles and lid. Large labeling area on all sides. Stacks 4 high. Accepts lever arch and magazine files. 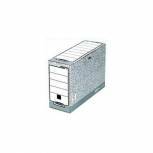 Bankers Box Grey Standard Storage Box (Pack of 10) 00810-FF Pack of 10 Bankers Box System Storage Box. Fastfold storage box is quick and easy to assemble. Accommodates A4 and Foolscap suspension files. Colour - Grey/White. 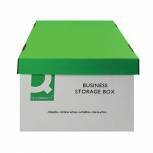 Q-Connect Brown Storage Box 335x400x250mm KF21665 Pack of 10 Q-Connect Storage Box. Durable rigid storage - a fully modular storage solution. This easy-to-assemble unit features lift off lid and cut-out handles and will accommodate 5x Q magazine files or 3x Q transfer cases. Dimensions with lid D335xW400xH255mm. 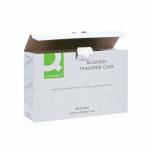 Q-Connect White Business Transfer Case (Pack of 10) KF21661 Pack of 10 Q-Connect Business Transfer File. Features a flip top lid keeping papers clean and dust free, large label area ensuring quick identification of contents and finger holes for easy retrieval. Internal - W98xD367xH235mm. 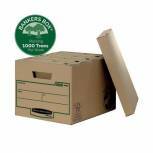 Bankers Box Buff Storage Bag (Pack of 25) 0011001 Pack of 25 Fellowes Earth Series Storage Bags. 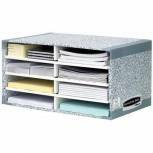 An inexpensive way to contain and protect bulk correspondence and filing. Manufactured from tough manilla with a tie closure and large label area for easy identification. Suitable for both A4 and foolscap papers. 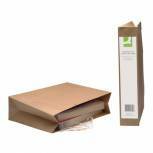 Q-Connect Manilla Computer Paper Storage Bag (Pack of 25) KF01392 Pack of 25 Q-Connect Computer Listing Paper Storage Bag manufactured from strong manilla with a reinforced spine. White tape for secure fastening and a large label area for ease of identification. Supplied flat packed. Internal dimensions - W75xD293xH384mm. 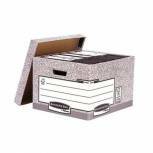 Fellowes Bankers Box System File Store Module 01880 Pack of 1 Bankers Box Magazine File 01880. 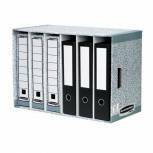 Easy to assemble corrugated filing module for storing a maximum of 6 lever arch files, A4 or Foolscap and will stack 4 units high. Colour - Grey/White. 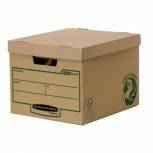 Bankers Box Earth Series Brown Storage Box (Pack of 10) 4472401 Pack of 1 Earth Series Budget Storage Box. Ecofriendly storage box. Hand holds for easy carriage. Sturdy double-layer corrugated cardboard construction. Manufactured from 100 percent recycled board with water-based ink. Internal dimensions W260xD325xH375mm. 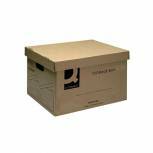 Bankers Box Brown R-Kive Earth Storage Box (2 Packs of 10) BB810443 Pack of 1 Our Fellowes storage boxes are available in both standard and large. 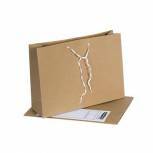 These boxes will not only hold all of your items but are environmentally friendly and hardwearing. 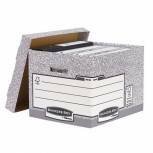 Bankers Box Brown R-Kive Earth Storage Box (Pack of 10) 4470601 Pack of 10 Durable storage box for paperwork and files. 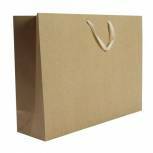 Manufactured from double thickness corrugated fibreboard with large label areas for identification and tote handles for ease of transportation. W325xD375xH260mm. 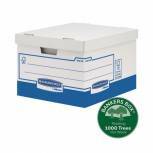 Bankers Box System Desktop Sorter (Pack of 5) 08750 Pack of 5 Eight useful compartments for the sorting and organisation of post, sales literature, forms and working papers. Front channels offer labelling option. Dimensions: W490xD310xH260mm. 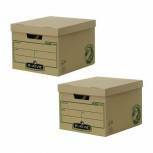 Fellowes Earth Series Large Storage Box (2 Packs of 10) BB810444 Pack of 1 Our Fellowes storage boxes are available in both standard and large. 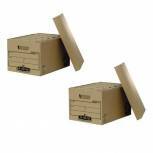 These boxes will not only hold all of your items but it is environmentally friendly and hardwearing. 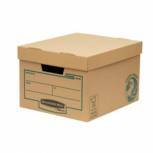 Fellowes Heavy Duty Bankers Box Large Size W380xD430xH287mm (Pack of 10) 001812 Pack of 10 Fellowes Large Size Bankers Box. Double thickness corrugated board. Reinforced handles. Stackable up to 6 high. W380 x D430 x H287mm. Grey/white. Q-Connect Brown Transfer Case (Pack of 20) KF21666 Pack of 20 Q-Connect Transfer Case. For storing files or individual papers, the case has a finger hole for easy retrieval. Accepts A4 size documents. Size: 317x92x241mm.